In addition to standard duty Slo-Motion speed humps, Barrier Group also offers models that have been designed for use in heavy vehicle applications, including B-Doubles. These modular steel speed control systems are ideal for use in transport depots, factories and terminals, among other environments. Heavy duty Slo-Motion speed humps feature a strong chassis construction, with 6mm floor plates and six bolt fixing, ensuring they are nearly indestructible. They can be used with or without end caps, which are available in rubber or steel, and have been designed to comply with AS 2890.1:2004. As with standard duty Slo-Motion steel speed humps, heavy duty models do not require a rubber underlay to prevent rattle, and are supplied complete with all fixings. 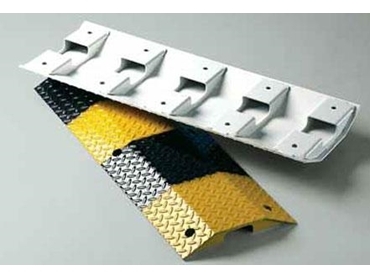 Concealed fixings remain accessible when using these speed humps, and a built in bridge design has been incorporated to accommodate hoses or cables.